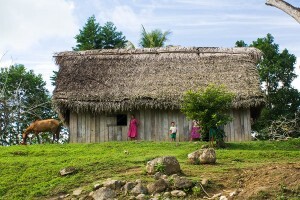 You are here: Home / blog / Belize Tourism Is Up Ten Per Cent Over Last Year! Belize Tourism Is Up Ten Per Cent Over Last Year! I’m not sure if it’s due to the Belize Tourism Board’s new leadership and resulting new polices, or it’s because the economy in the U.S. has improved somewhat this year but tourism is WAY up over last years numbers. There was a shake-up at the top of the BTB last year with new leadership taking over the helm of Belize’s most important income generating industry… the tourism industry. The new board hired a new marketing company which has embraced the information age, especially social media and it seems to be paying off. Especially notable is the increase in visitors coming through the airport, and also the overall number of over-night stays. I also noticed the number of tourists arriving during the traditionally very slow summer months was way up. Hopefully the BTB can keep up the great work! 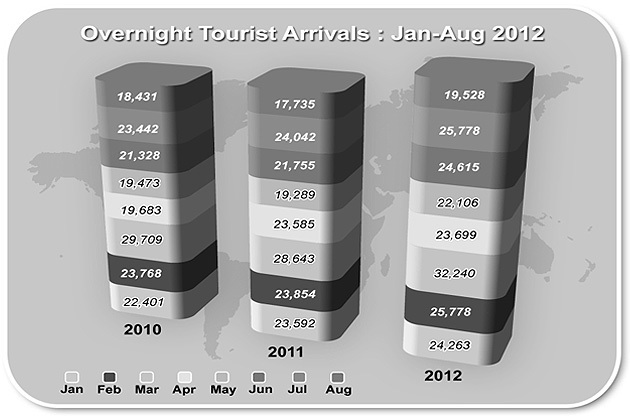 The year 2012 began with a record breaking number of overnight tourist arrivals. As we continue in the third quarter, we see a steady increase in the overall arrival of overnight tourists. Airport arrivals have also seen very favorable growth and this trend is expected to continue for the remainder of the year. The BTB is delighted to share this phenomenal year in the tourism sector. The following is a detailed report of the first 8 months of this year. The year 2012 began with a record breaking number of overnight tourist arrivals. As we continue in the third quarter, we see a steady increase in the overall arrival of overnight tourists. Airport arrivals have also seen very favorable growth and this trend is expected to continue for the remainder of the year. The BTB is delighted to share this phenomenal year in the tourism sector. The following is a detailed report of the first 8 months of this year. Thus far, 2012 has seen an 8.5 % increase in overnight arrivals when compared to 2011, and an 11.1% increase when compared to 2010. This means that there have been a total of 15,512 more overnight tourists in Belize when compared to last year. January began with an amazing 24,263 arrivals. As incredible as the starting month was, the peak month for overnight arrivals was March with an astonishing 32,240 overnight arrivals. July saw a 7.2% increase in tourist arrivals, adding up to 1,736 more tourists, while August hosted 10.1% more tourists, totaling 1,793. As demonstrated in Figure 1, May has seen the largest growth when compared to the previous year with a 14.6% increase, totaling 2,816 more visitors. This is followed by June, with a 13.1% increase, then by March, with a 12.6% increase. April remains relatively steady with an increase of 0.5%. Overnight tourist arrivals are expected to see a continuous increase going into the end of the year in light of the Maya 2012 celebrations. This also marks the start of the tourism high season, which begins in November. Airport arrivals have also seen a continuous increase compared to previous years. Thus far, 2012 has seen a 15.1% increase when compared to 2011; this is an astounding 20,214 more tourists travelling to the Philip Goldson International Airport than the previous year.